Gabe and I moved to Ybor city almost a year ago. We live in a cute condo, 2 blocks from 7th Ave. Close enough to walk down to the amazing restaurants and festivals that Ybor City is known for, yet far enough to stay away if you don't want to deal with the crowds at night. I LOVE living in Ybor. One of the first things I fell in love with in this amazing city is the Cuban Sandwich. I must also add one of the first things we noticed was that it seemed EVERY restaurant in Tampa that serves the Cuban has "The Worlds Best" Cuban Sandwich. Too add onto that, last month, Tampa and Miami engaged in a culinary smackdown over the Cuban. Miami claims it is theirs, but it is historically Tampa's. And now it is now officially ours. The Cuban Sandwich is now the official sandwich of Tampa. 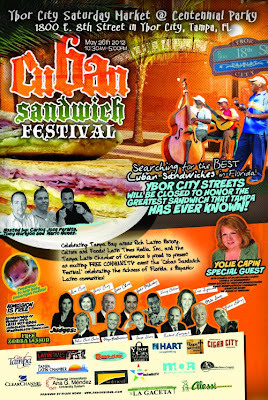 With all this madness over the Cuban, I was very excited to hear about what is taking place next weekend, a Cuban Sandwich Festival! Where else would you have it other than historical Ybor city. Whoever takes the prize home will officially have the worlds best Cuban sandwich! If you can't make it out on Saturday, you can always try to make this gem at home thanks to Food Network. 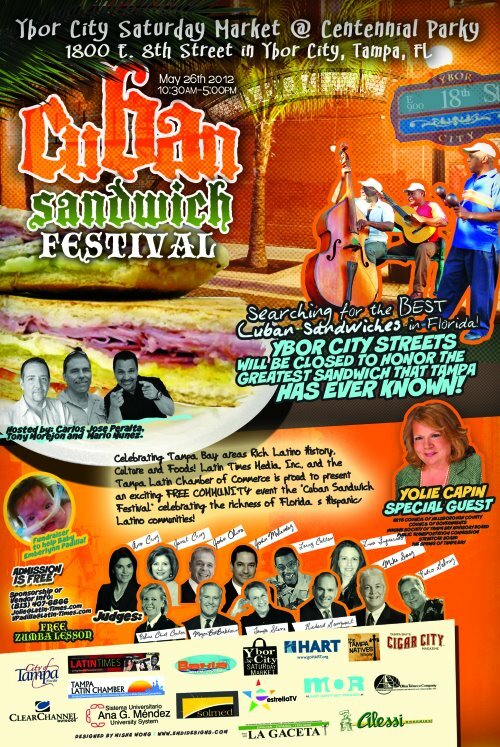 40 restaurants are getting together on Saturday, May 26th for Tampa’s first Cuban Sandwich Festival at the Ybor City Saturday Market from 10:30am-4:30pm. Ybor City Streets will be closed in honor of the Tampa Cuban Sandwich. This free FREE event is presented by Latin Times Media. A few of the 40 competitors for Best Cuban Sandwich include: Alessi Bakery, Mata Monchies, Mr. Empanada , La Teresita, Stone Soup Company, Gaspar’s Grotto, Franks & Subs, Cacciatore Brothers, Danny’s All American Grill, Cafe Masaryktown and the Floridian! This is a family event and there will be a kid zone, including clowns (keep them away from me please), jumpers, face painting, and more. Live music will be provided by Hansel of Hansel y Raul in addition to other live performers. Judges for the competition include Tampa Mayor Bob Buckhorn, Tampa Chief of Police Jane Castor, Richard Gonzmart of the Columbia Restaurant, and more.